So I was in NYC for the past four days and one of the things at the top of my to do list was to see the Jeff Koons exhibit at the Whitney. This exhibit is the first time that the entire Whitney building is filled with the work of a single artist. It's also the last exhibit in the current building before the Whitney moves to a new location in the meatpacking district. So besides the fact that I love Jeff Koons, there were multiple reasons to attend. On Saturday, it was absolutely pouring. Luckily, the rest of the weekend was quite possibly the most perfect weather imaginable so we decided it was the perfect opportunity to seek shelter from the rain in the museum. Luckily, we were blessed with some Whitney passes (shout out to the Weatherley-Whites) so got to breeze by the line of people waiting in the rain that ran around the block (!!!). Once safe from the rain, we started at the top floor. In hindsight, it probably would have been better to start at the bottom and work our way up because it became clear once we were done that the top floor was the finale of the exhibit. It held all of the large scale, show-stopping pieces that are quintessential of Jeff Koons' work. The show is beautifully installed and curated by Scott Rothkopf. It truly was well done and the fact that it was the final hurrah for the Whitney on Madison made it all the more special. I love the fun nature of all of Koons' works and his eye-catching textures, colors and materials. 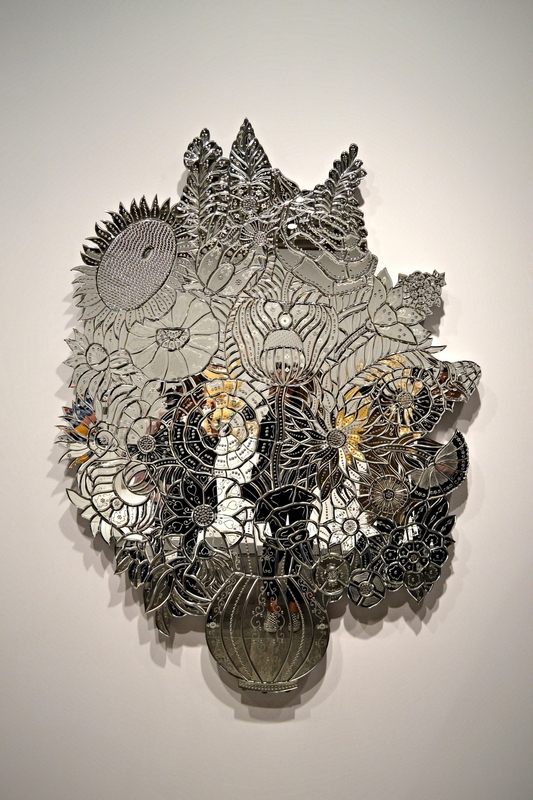 His use of industrial fabrication in connection with pop culture obsessions stretches beyond what other artists using readymades are able to accomplish. Maybe it's just my guilty pleasure and obsession with pop culture but all of the pieces in the show had a certain aspect of seduction to them. This was partly due to the great curating and lighting, but obviously mostly a result of the artist's great work. Inflatable Flower and Bunny (Tall White, Pink Bunny), 1979. I recommend running over to the Whitney to catch the tail end of the exhibit, which runs through October 19th. Bring your camera and work your way up from the first floor. If you have access to Whitney passes, certainly take advantage -- maybe it was just because it was raining but the fact that this exhibit has been up for months already has not slowed the crowds! Also, make sure to follow "stixandstonez" on instagram to see grams from my various travels and activities, like the one below from this exhibit.